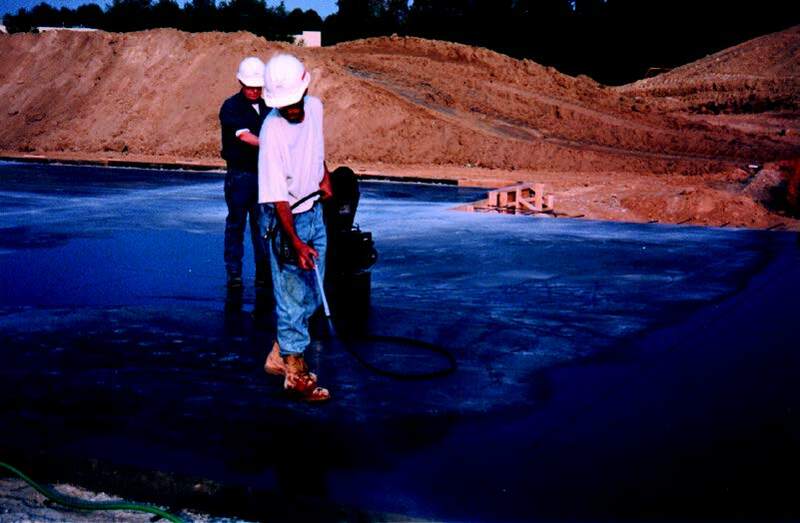 A growing trend within the concrete flooring industry is to apply liquid hardeners on freshly-troweled concrete in what is referred to as a “pre-seal” or a “cure-coat.” Conversely, Nox-Crete has historically advised applicators to wait and apply liquid floor hardeners a minimum of 28 days after concrete placement to allow for maximum performance. The 28 day recommendation was based on intuition and a strong understanding of the chemistry behind liquid floor hardeners and the means by which they densify concrete surfaces. The lack of conclusive data led Nox-Crete to not only ask but to answer the question, does the timing of the application (Day One vs. Day 28) impact the liquid floor hardener’s ability to improve abrasion resistance? When water reacts with cement, it forms calcium silicate hydrate gels that provide most of the strength in concrete. A byproduct of that reaction is calcium hydroxide, a soft material that does little to increase the strength of concrete yet it occupies as much as 15% of the volume of cement paste. 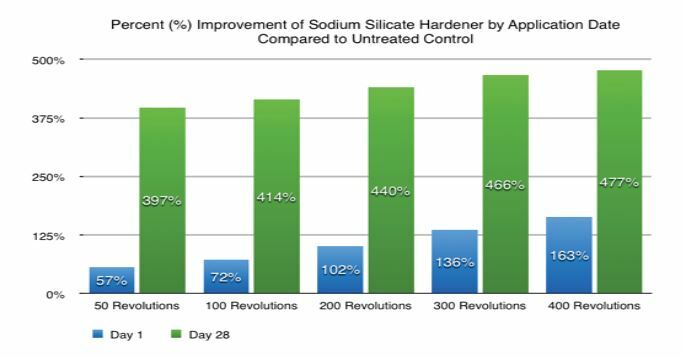 Silicate-based liquid floor hardeners take advantage of calcium hydroxide by chemically reacting with it to form calcium silicate hydrate gels – the desired component in concrete. These gels fill calcium hydroxide-saturated bleed water channels and voids to increase the treated concrete’s surface density, strength and durability. The majority of the surface pores and capillaries in freshly placed concrete remain filled with mix water for several hours or longer after concrete placement. As concrete hydrates and cures, mix water can remain within the concrete for days or longer continuing to react with cement resulting in stronger concrete. The longer the concrete has to hydrate the more calcium hydroxide byproduct and calcium silicate hydrate gels are produced. By day 28, the majority of the cement has been hydrated, much of the excess mix water has evaporated and the concrete has reached its theoretical design strength. With little time to properly hydrate on day one, the concrete slab contains a limited amount of calcium hydroxide available to chemically react with the liquid hardener. Simultaneously, the presence of excess mix water prevents the liquid hardeners from penetrating deep enough into the concrete to react with any calcium hydroxide that may be present. The liquid hardener, unable to penetrate concrete pores and with limited amounts of calcium hydroxide to react with, remains on the concrete’s surface and reacts with the air to form useless, non-strengthening salts. Conversely, after 28 days of hydration, pores and capillaries are theoretically free of excess mix water and calcium hydroxide is abundant. Hardeners, having a clear path into the pores and capillaries and able to penetrate beyond the concrete’s surface, react with the calcium hydroxide throughout the slab and create calcium silicate hydrate gels. The performance of liquid floor hardeners are limited when concrete to be treated lack a sufficient amount of calcium hydroxide, or when it is unable to penetrate due to the surface being saturated with water. -All concrete test specimens were cast from the same batch of concrete. -The specimens were air-dry cured in a temperature controlled room in sealed plastic bags with 100% humidity for seven days at approximately 100°F and then allowed to air-dry for 21 days at room temperature. -Liquid hardeners were applied to all specimens at 200 sf/gal. -“Day One” Disk specimens were treated with a traditional silicate based liquid hardener approximately eight hours after the test specimens were cast. -“Day 28” Disk specimens were treated with a traditional silicate based liquid hardener 28 days after the test specimens were cast. -A third set of Disk specimens were not treated with any liquid hardener and served as “Control” for testing. -All concrete disk sets were tested 42 days after the concrete specimens were cast. The ASTM D4060 Taber Test Method mounts concrete disk test specimens to a turntable platform that rotates at a fixed speed. Two abrasive wheels are lowered onto the specimen’s surface and abrade the specimen as it rotates. Abrasion is measured by the amount of ground up concrete removed from the surface. Concrete dust/debris is carefully collected from the abraded specimen and weighed on an analytical balance. The more concrete debris removed and collected, the more heavily abraded the surface. The application of liquid floor hardener on day 28 confirmed it as the premier option through all five intervals of testing, beginning at 50 revolutions and ending at 400 revolutions. At the first interval of testing, 50 revolutions, the “Day One” disk set provided only a 57% increase in abrasion resistance over the untreated control disks. At the same 50 revolutions, the “Day 28” disk set provided a staggering 397% in abrasion resistance over the untreated “Control” disks. The “Day 28” disk set continued to outperform the “Day One” disk set ending with a 477% improvement in abrasion resistance over the untreated “Control” at 400 revolutions compared to the “Day One’s” 163% increase in abrasion resistance against the untreated “Control” disks at the same number of revolutions. The timing of the application (Day One vs. Day 28) does impact the liquid floor hardener’s ability to improve abrasion resistance, impact resistance and long term durability and performance of the floor slab. These results validate what Nox-Crete has advocated for years – apply liquid floor hardeners after 28 days for maximum performance. The concrete disks with the hardener application on Day One significantly underperform when compared to the disks treated with the hardener on Day 28. This is likely a result of a lack of sufficient calcium hydroxide available to properly react with the hardener on Day One and excessive mix water preventing the liquid hardener from penetrating as deep as it can after 28 days of curing.